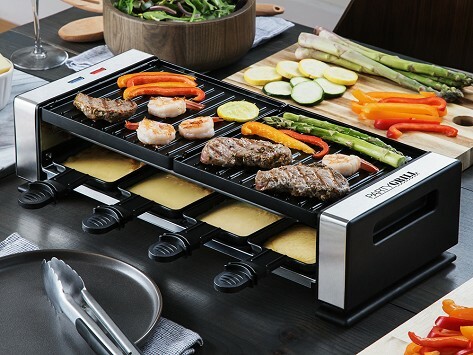 This raclette grill makes get-togethers more social by gathering the crowd around to cook their own dishes. Grilling things like proteins, veggies, and even making pancakes and eggs is easy, fun, and of course tasty. (Don’t forget all that deliciously gooey melted cheese, too.) Two reversible grill tops can make a variety of dishes and handle groups up to eight people for big game parties, brunches and more. Dimensions: 18.5" x 8" x 4.5"
It’s a lot like tailgating but because it’s all done inside, you can fire it up no matter the weather or time of year. Groups of up to eight people can cook their own bites, or the grill is also a cozy and fun way for couples to enjoy a date night in.